The distance award goes to Hisa, 7L4IOU (Tokyo). He not only copied the 20 meter run but turned in a sub 100 mHz reading! Summer time propagations conditions continue. 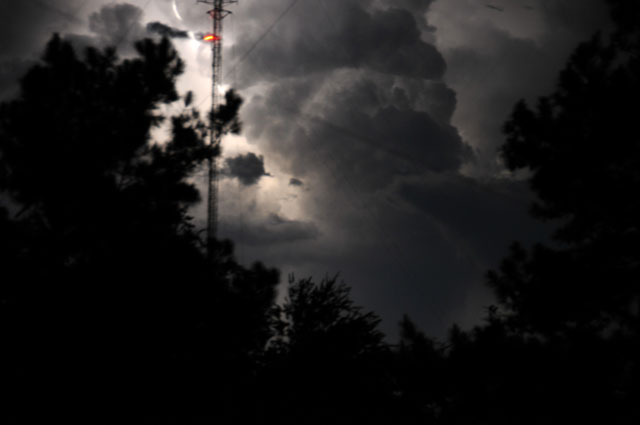 QRN was very bad at my QTH as a severe storm was nearby. Thanks for the comments on the two 80 meter antennas. I hope to have antenna "B" completely vertical by the next FMT. It will be interesting to see if the vertical gives better (Doppler) results than the mostly horizontal dipole. Mr. Doppler really played havoc with Marvin's 40 meter signal. Aside from the two LAX stations who are within direct/ground wave range, WA1ABI was the only station to read within .1 Hz. *Burt is in direct/ground wave range of Marvin (about 8 miles). 7L4IOU JAPAN This is my first FMT entry. CW was readable at Noon time here in Tokyo under low SSN. Thank you for the chance ! K1GGI EMA K5CM peaked 20over on 20, decent signals all around. The 80m A ant may have been slightly better than B. Lots of spread on W6OQI. Couldnt stay awake for 160. Thanks for the fun. 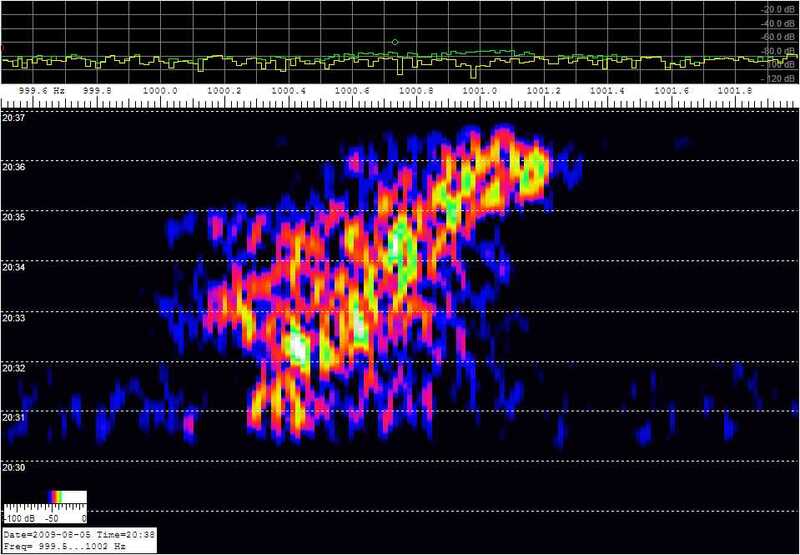 K5CM OK Signal was good on 40 meters but the Doppler spread made it very difficult to find the real frequency. Lots of QRN from the very nearby storms. Thanks Marvin. K6APW EB Noise buried 160M, be lucky my measurement within 5 Hz. The 80M signal was totally NIL. Thanks for fine efforts by both stations. K6HGF LAX No copy from K5CM on 7:45PM(PDT) run. Heard K5CM at approx. 8PM, but with another station calling CQ right on top, so unable to copy. K7TT WWA My technique this time was lousy. Only hand notes to go by. Messed up my Spectrum output file data. But... Good Signals. No copy on 80M/80M_b as you weren't there till later I discovered in your email too late. Always is intense but it is always fun. Thanks. KA1BQP RI First FMT. Thanks to John WA1ABI for the help in getting set up. Freq Std IFR1500S, Rig ICOM IC756PRO, Ants 2 Ele SteppIR, dipole. KD2BD NNJ Connie, thanks for dodging the lightning bolts to conduct this FMT! Your 80-meter signals suffered from moderate QRN and QSB that certainly affected the accuracy of my measurements. Signals during the first 80-meter transmission may have been slightly stronger into New Jersey. KØMZ KS Thank you Connie and Marvin. All signals on 40 and 80 were good in KS. The signals on 20 were very weak off the side of the beam up North. I used an Atlas 210X for the receiver, TR-7 for local reference signal, and a Heath IM-4100 counter that drifts. The counter is hard to keep in tune. Next time I hope to have an HP10544A OCXC run my counter for better accuracy. N3FG EPA Good copy on 20M both east and west. Very heavy QRN on 40M. Couldn't hear the 80M signal. Lots of QRN. N5DM STX Kenwood TS-480 & DigiPan. K5CM 80m: Antenna "A"=S9+20db, Antenna "B"=S9+10db. N8OB OH Antenna "B" on 80M was much better here in OH. Could not hear anything on Antenna "A". Good signals on 20 and 40. Much fun as usual. W1PW AZ Didn't hear K5CM on 80M; learned too late that it had been delayed. 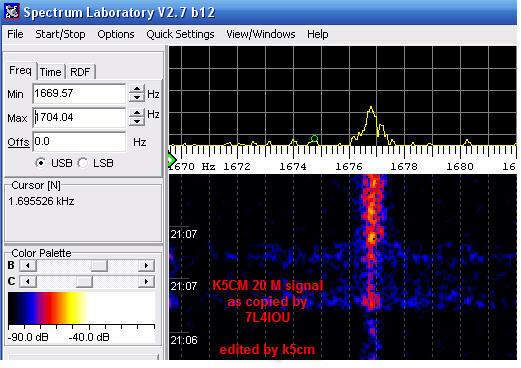 Moderate Doppler on K5CM 40M signal. Lots of Doppler on both 40 and 80 WC signals. Thanks Connie and Marvin for running these tests. 73! W2FD WPA Did not hear K5CM on 80 meters. 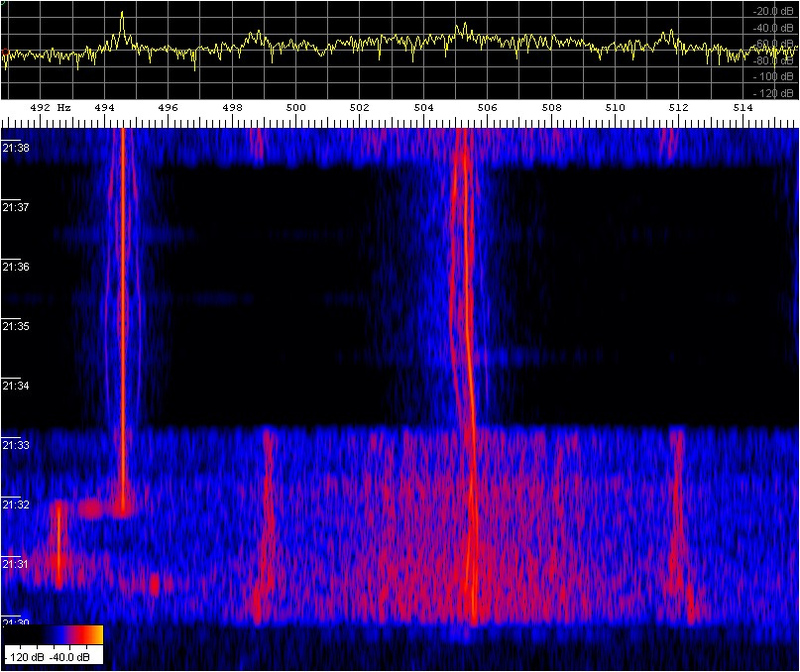 Noisy conditions for both of W6OQI transmissions. Thanks again K5CM and W6OQI for the tests. W3JW VA Signal strengths and Doppler spread were about average here. the K5CM 80 meter A signal was S9 and the 80 M B signal was S7. Static peaks were well above those numbers so my conficence in those numbers is less than "high". I didn't see the email about the 160 meter run until Thursday morning; where are all those long delayed echoes when I need them? 73 and Tnx to you and Burt! W9TJ IL 20 doppler as wild. I found 0.1 hz difference between E ad W headings. 40 sigs S9+30, QRN 7 - 9. On 80 I assume 80M is first go and 80M_b second try. 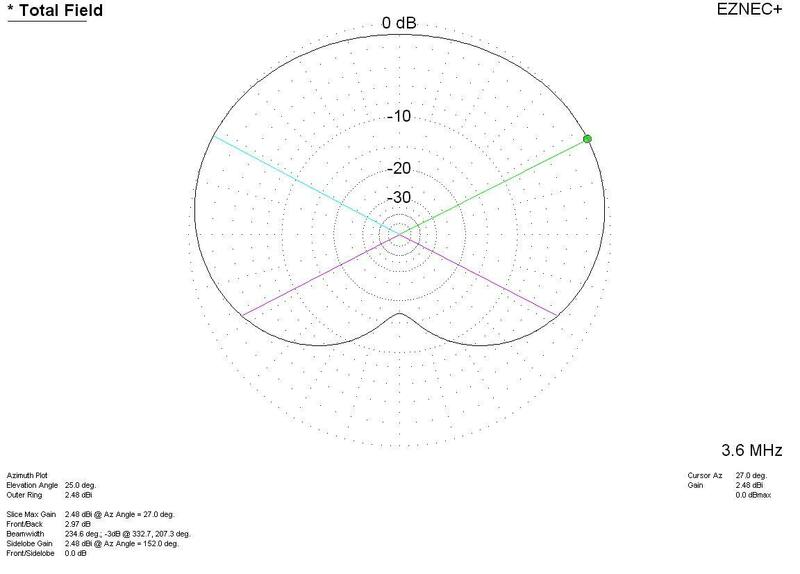 80 sigs S9+10 to +20 QRN S7 with lots phase reversals. 160 sigs were great S9+20 on 80 mtr dipole and QRN S-6. Some QSB on 160. West coast 40 sigs S9 QRN 7 to 9+10 doppler wild. WC 80 sigs S8 with QRN 7 to 9+10. Thanks to all and to Connie for the 160 add on. W9ZB IN The two 80M ant sigs about were equal strength, although QSB masked differences for me. West Coast weaker, with even more QSB. 160 sig was very strong & band appeared otherwise unoccupied on CW. A fun run, except for the late bedtime here in the EDT zone. WA1ABI RI Lots of static but fairly good sigs. Very wide spread here on Marvin's 40m run. Connie's 80m 'A' signal better S/N than 80m 'B'. Tnx Connie and Marvin. WB9FIP WI Conditions certainly were not a "slam dunk" on any band! Your 80M "A" antenna was just about 1.8 dB better than the "B" version here in Wisconsin. Thanks for the fun. Hear a brief audio snippet of Marvin's 40 meter signal. 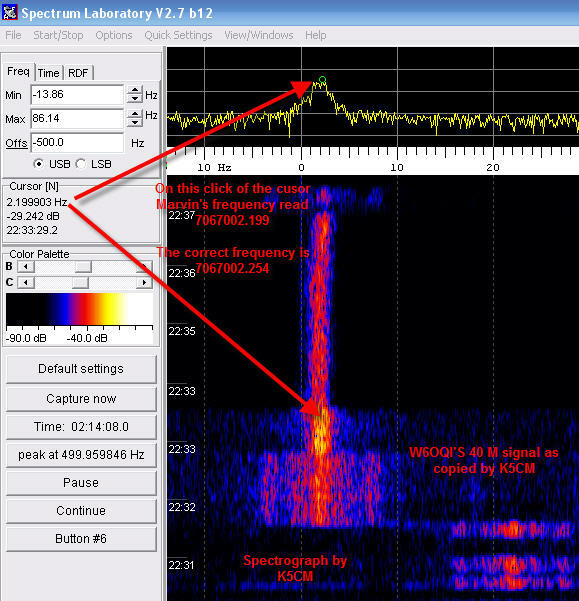 comment from Earl, N7EP: It was at Sunset here in Seattle, and the signal shifted up 1 Hz in 3 minutes. 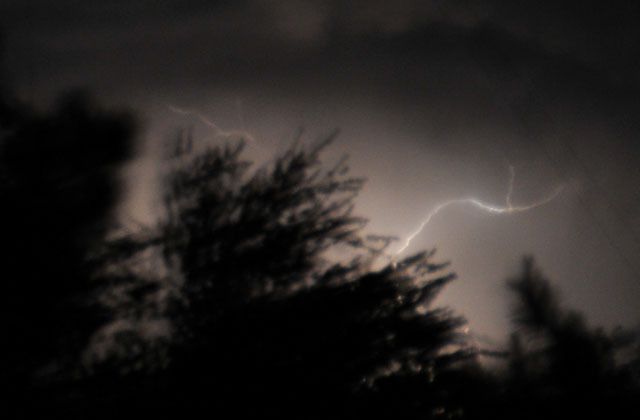 My photography is a little shaky, but it still shows the nearby storm. Its completely dark out except when the lighting was striking. A HP Z3801 GPS frequency source clocks a HP-3336B. A 10 db transistor amp follows and drives a 12BY7 / pair 6146. Then to the final amplifier, a Tokyo Hy-Power amp running 500 to 600 watts out on 160, 80, 40, and 20 meters. There are no mixers or any device in the chain of amplifiers that might impact the accuracy of the GPS frequency source. As a reality check, I periodically log the frequency source against WWV and other GPS referenced sources. I monitor each transmission with a completely separate receive system to look for any instability or short term drift. The separate system is not locked to the GPS transmitting system. 80B- Dipole at about 65-70 degree slope (near vertical).